From legendary FBI profiler John Douglas and Mark Olshaker -- authors of the nonfiction international bestsellers Mindhunter, Journey into Darkness, and Obsession -- comes an unprecedented, insightful look at the root of all crime. Every crime is a mystery story with a motive at its heart. 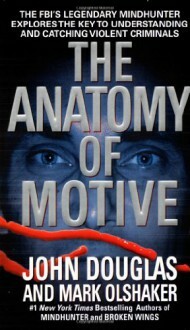 With the brilliant insight he brought to his renowned work inside the FBI's elite serial-crime unit, John Douglas pieces together motives behind violent sociopathic behavior. He not only takes us into the darkest recesses of the minds of arsonists, hijackers, bombers, poisoners, assassins, serial killers, and mass murderers, but also the seemingly ordinary people who suddenly kill their families or go on a rampage in the workplace. Douglas identifies the antisocial personality, showing surprising similarities and differences among various types of deadly offenders. He also tracks the progressive escalation of those criminals' sociopathic behavior. His analysis of such diverse killers as Lee Harvey Oswald, Theodore Kaczynski, and Timothy McVeigh is gripping, but more importantly, helps us learn how to anticipate potential violent behavior before it's too late. Essential reading for anyone who wants to understand criminal profiling. Especially eery because Douglas' analysis of Timothy McVeigh, who set off the Oklahoma bomb exactly matches the personality of Anders Breivik, who bombed and shot 84 people in Norway last year. Amazing masterpiece of clinical diagnosis by the FBI's legendary mindhunter. Highly recommended to those writing crime novels of any kind.